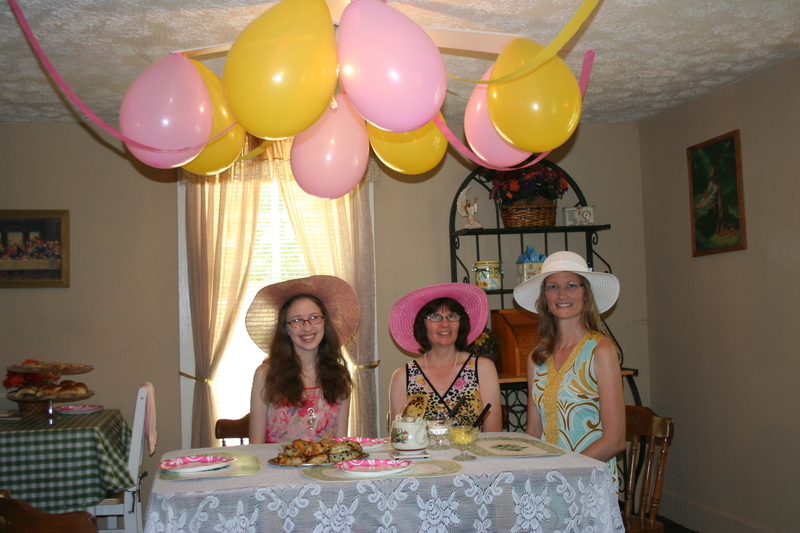 In this post: My Mom, Sister, and I have our first tea party together and we glam it up like southern belles with big hats and all. Also some wonderful parenting videos from Hill Country Church in Austin, TX. Thanks Jenn for the link! Hello dear ones! Before we start I want to share with you the link to the parenting videos. Also, here’s one fashion attempt. Last week, I shared with you a couple “how to” Youtube stations. 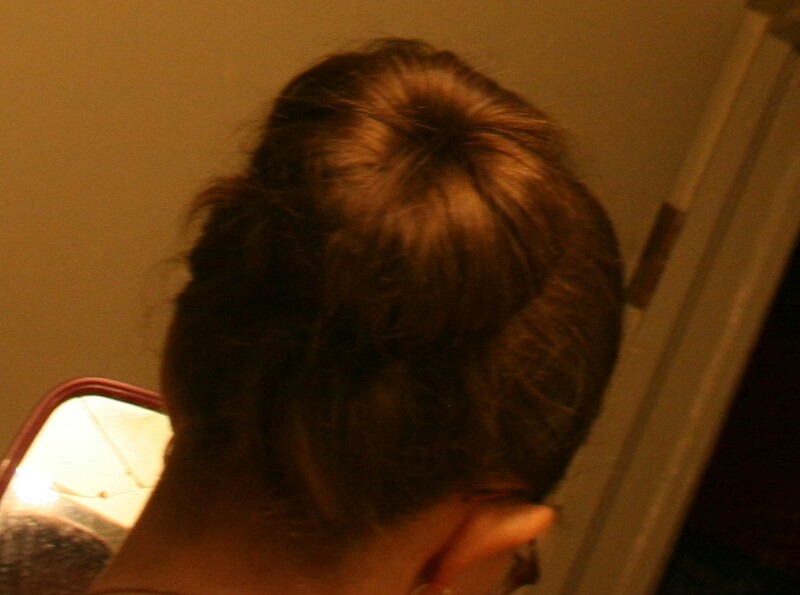 Well, I learned how to do a sock bun. It’s supposed to be a method to curl your hair but I think it’s just as pretty left as a bun. I’ve yet to be successful with the curls part. Here’s my bun. You just take a sock and put it over your pony tail. Then you roll your hair into the sock. You have to make sure you have even coverage so the sock doesn’t show through. It takes muscle lol. 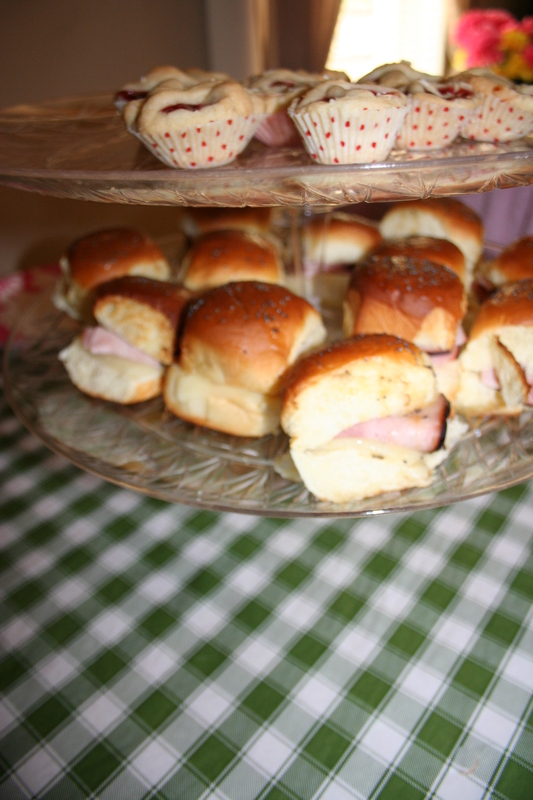 The Eats: Scones, Swiss Ham Sandwiches, & Itty Bitty Cherry Pies. 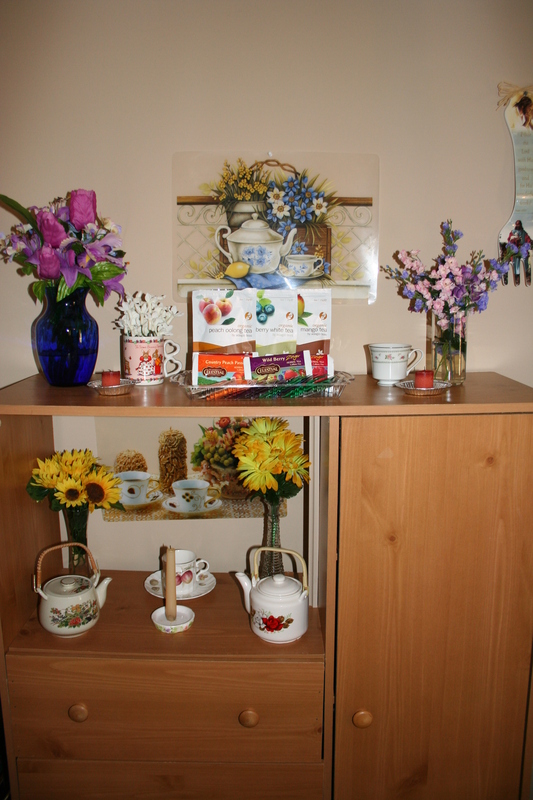 Also a variety of herbal teas. I prefer the plain kind with sugar and cream. My sister made the sandwiches with black forest ham, Swiss cheese slightly melted, and dinner rolls cut in half. 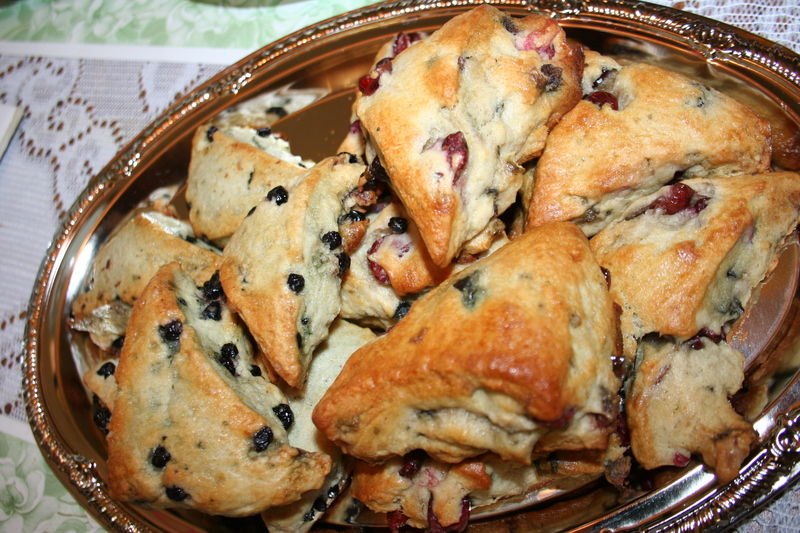 Mom got the scones already made and they warmed them up in the oven. Quick and yummy! 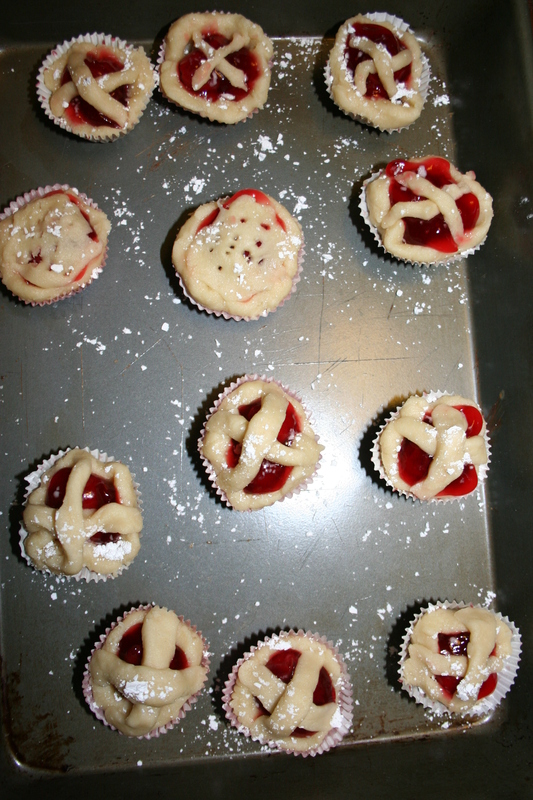 Many moons ago I made mini cherry pies. I did the same thing except they are super mini. 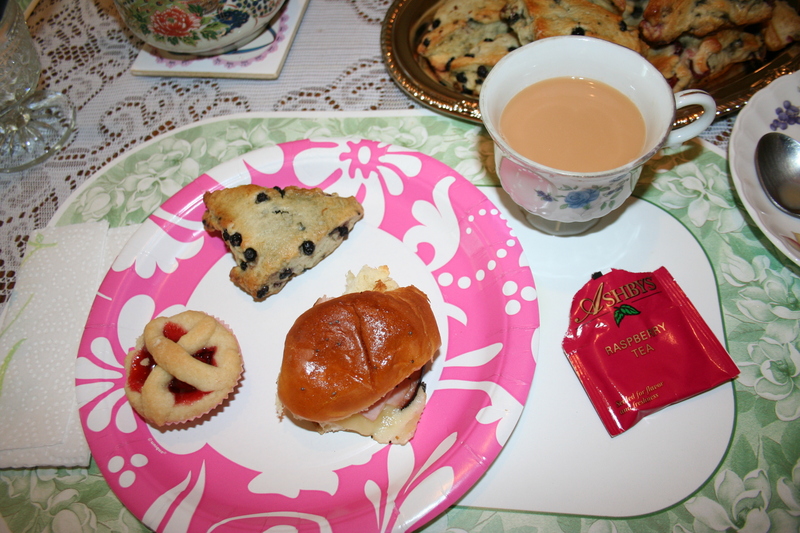 I had small cupcake liners. I formed the crust in the bottom and dropped a little over a spoonful of cherry pie filling and then made a criss cross top with the dough. So these are itty bitty cherry pies. That’s powdered sugar on top. 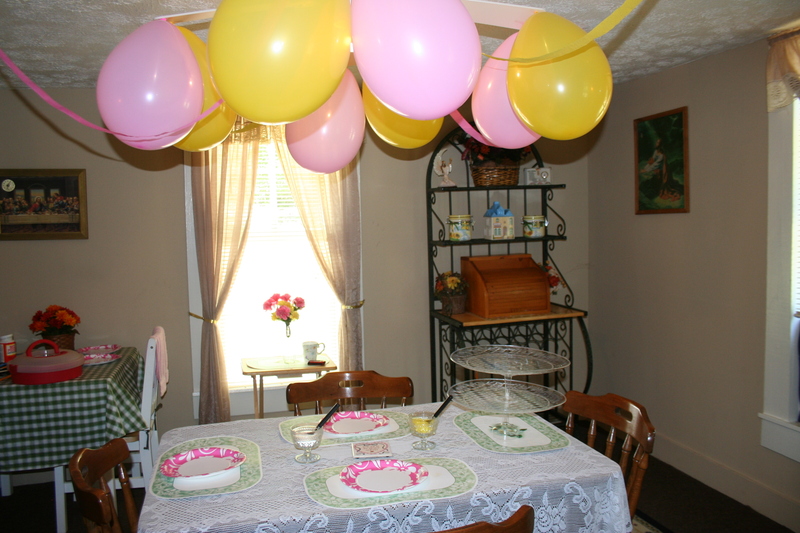 Flowers, tea pots and tea cups, and pink and yellow balloons. 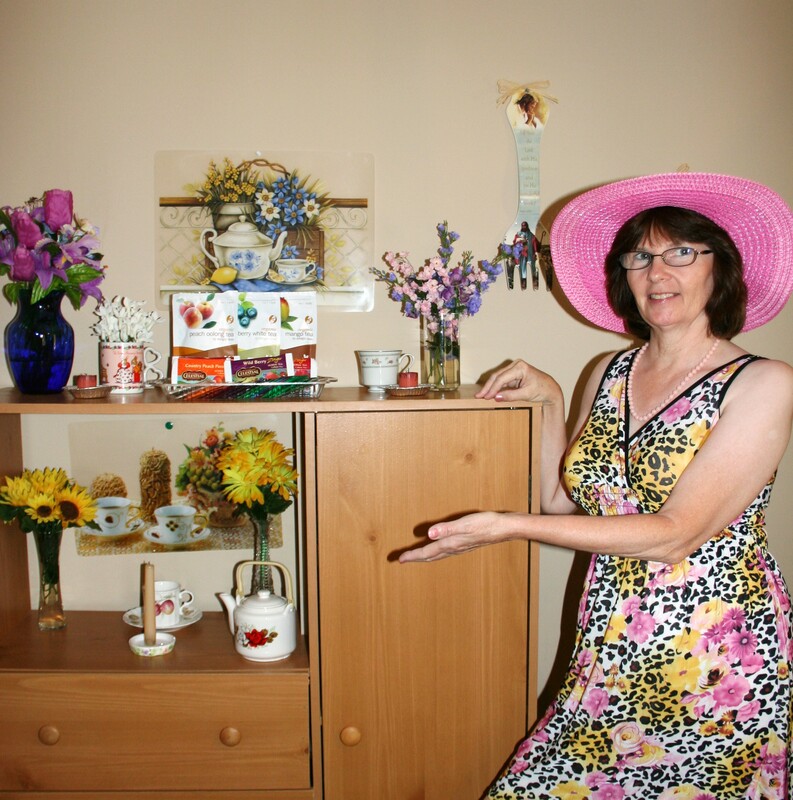 Mom found her flowery tea pot on the right at a thrift store. 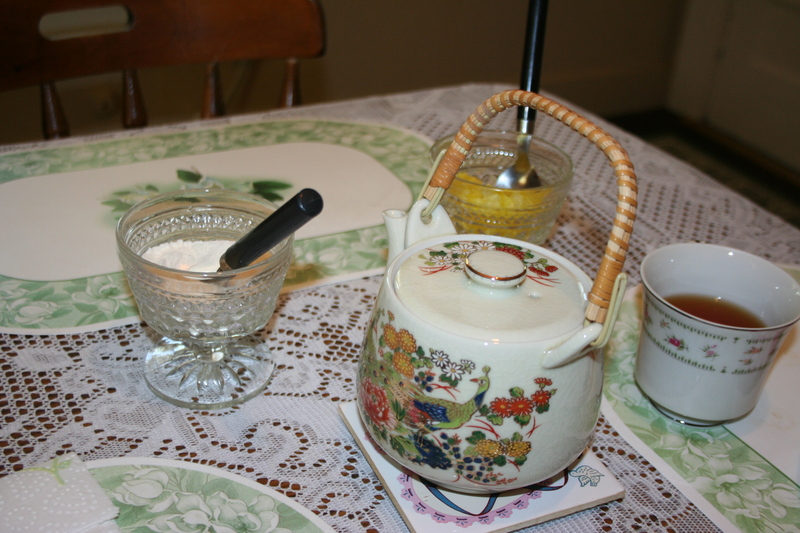 My teapot on the left is a Japanese antique that I found at an Antique shop for 5 bucks. I found the cups separately but they match. Go figure! We used both of our sets. 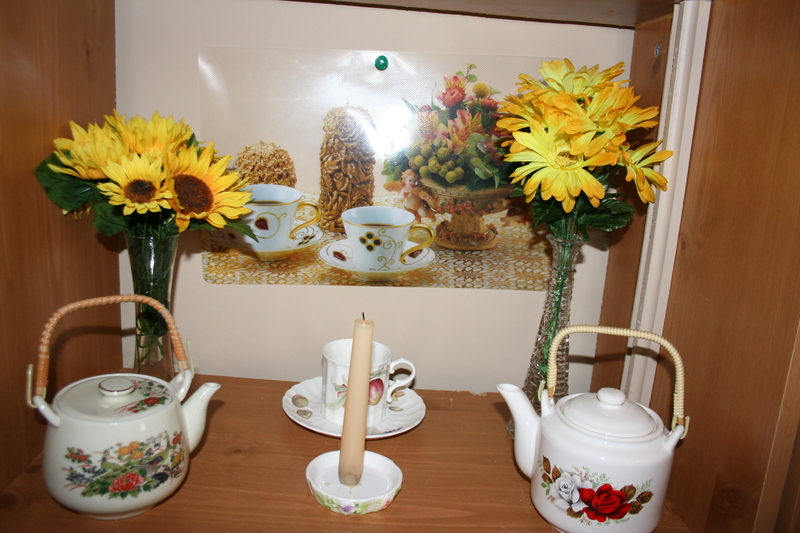 The Mood: My sister Jenn set the mood with a classical music cd that also had nature sounds on it. 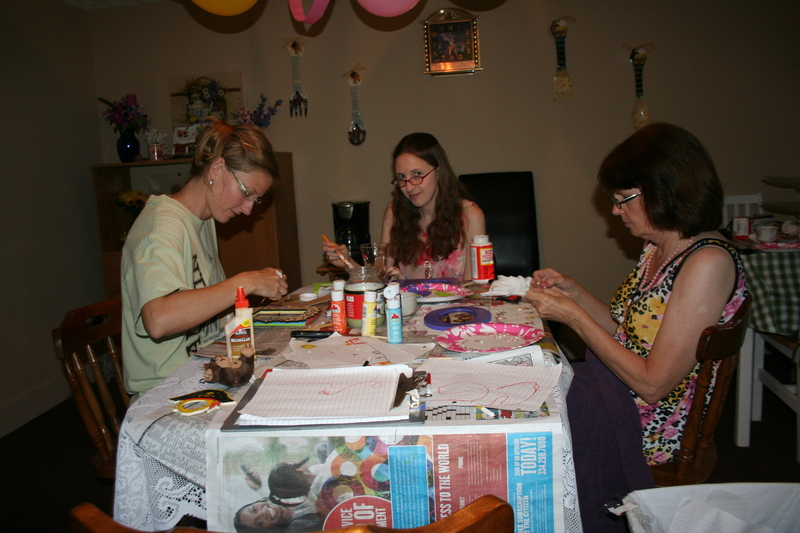 Some more pics and then on to our craft :). We were going to decorate our hats but they looked nice enough the way they were. We had fun with the poses. 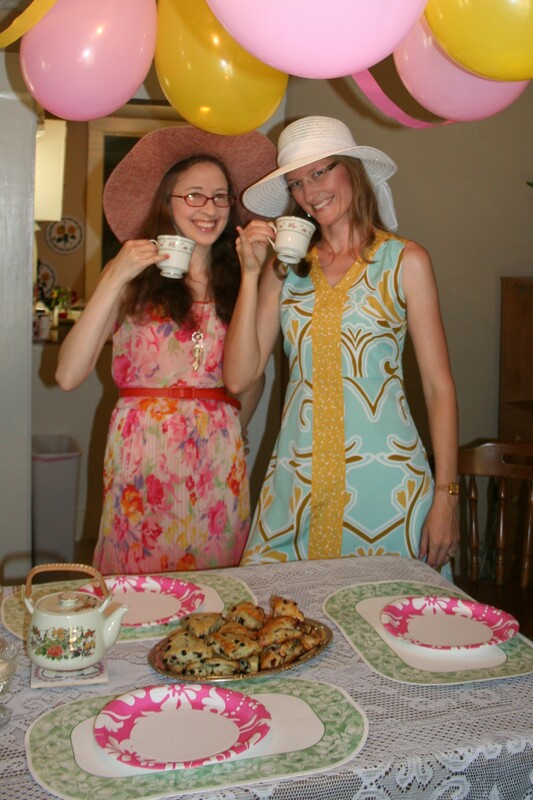 We acted very prissy and high class. Mua~ that’s the other dress I got at JC Pennies on sale. 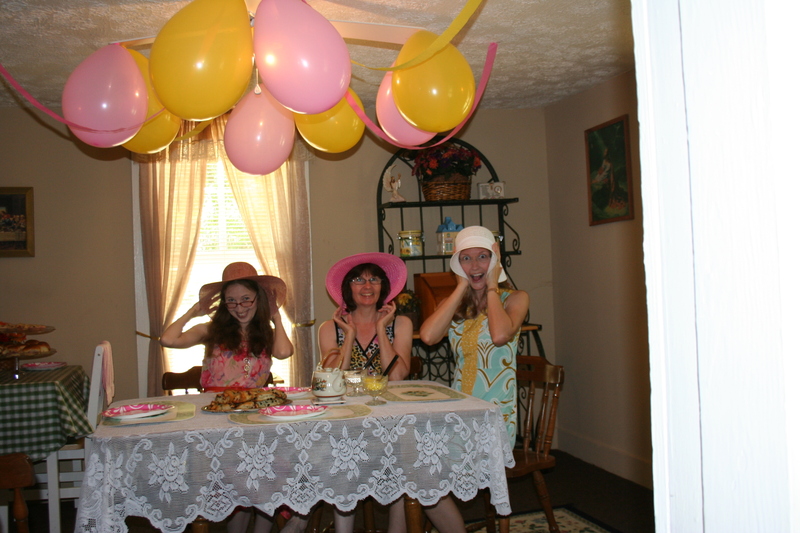 This party was very special because we had never done anything like this before. That seems strange since my Mom had two girls but my (half) sister lived with her Dad and we only saw her during the Summer and Christmas. We are also seven years apart (hint: I’m younger). 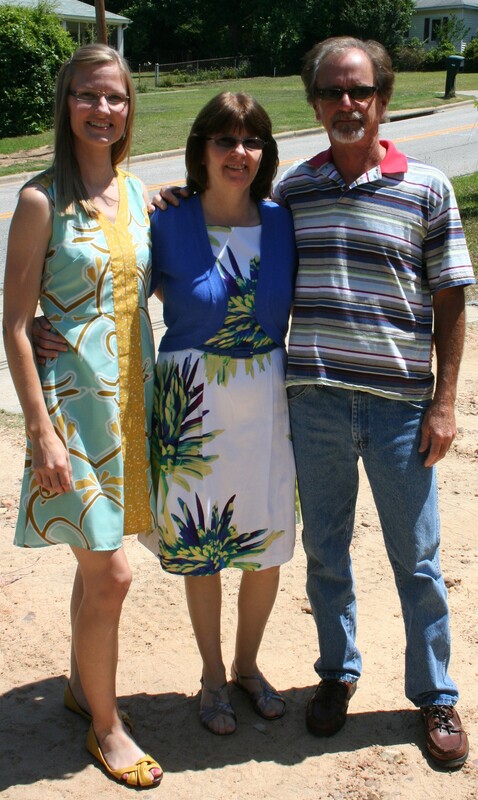 My Mom was a single Mom and worked a lot. 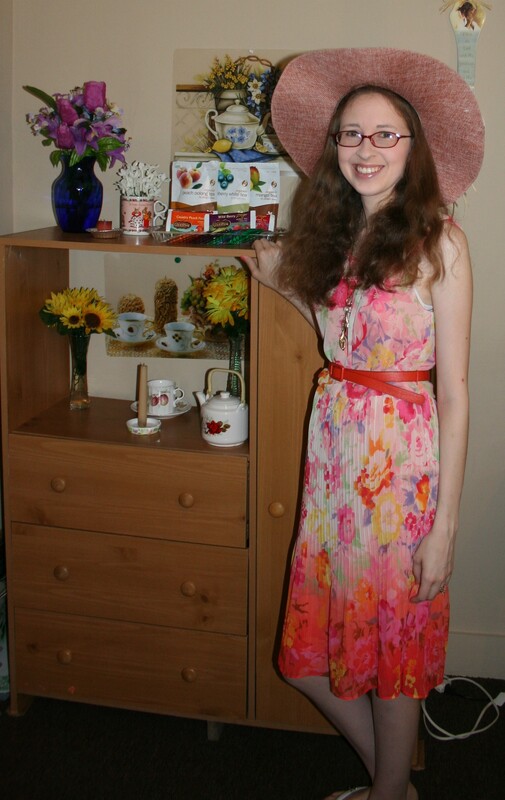 As a kid I was a complete tomboy though I did play with tea sets on my own. We just never got to it. 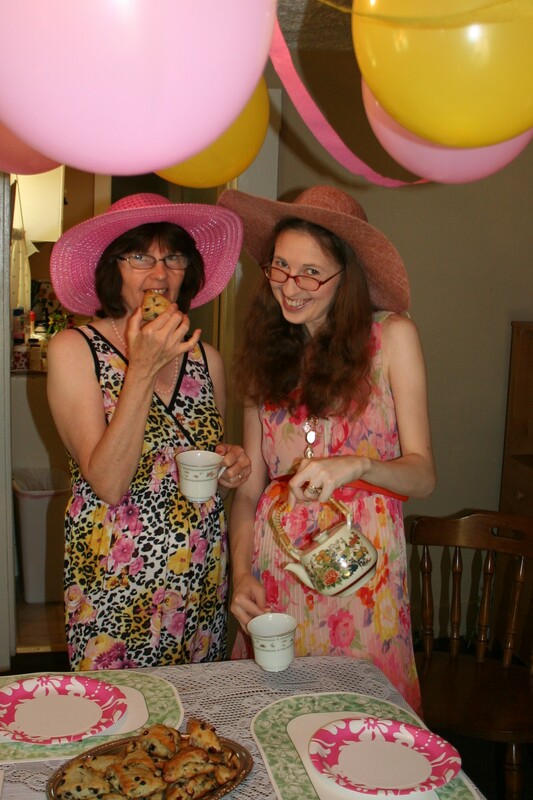 We had so much fun at this party that we all wondered why we had not done it before. The best part was talking for hours and spending time just the three of us. 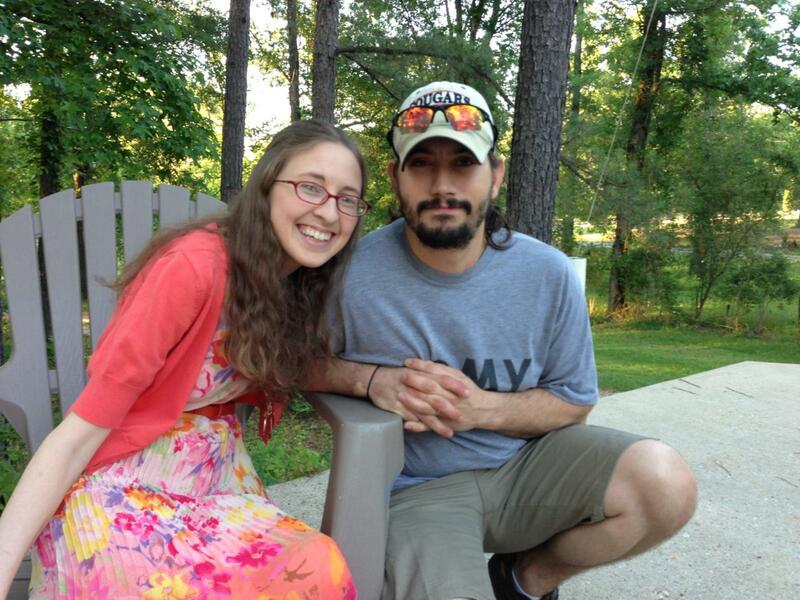 Usually we have to share Jennifer with the rest of our family :). But she flew straight here by herself and the guys were at work. 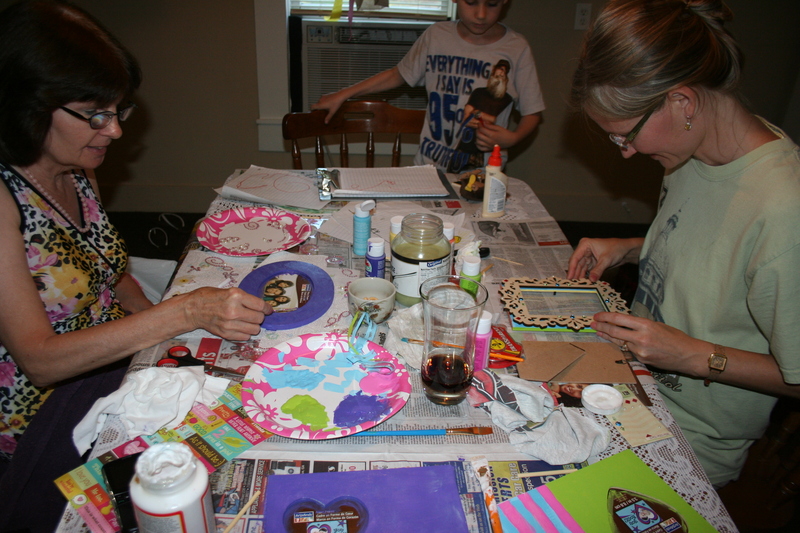 The Craft~ Mom forgot what she wanted to do for a craft. 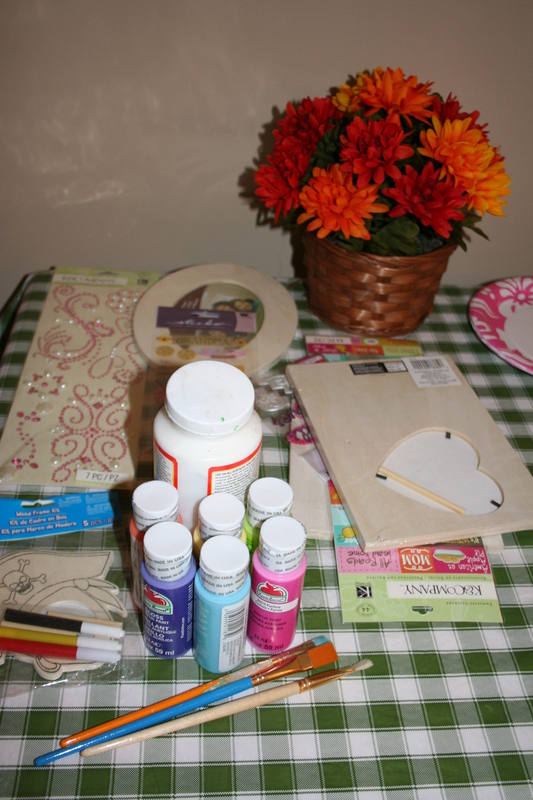 So the day before we all put our heads together and looked through Michael’s craft store. We found some cheap frames and lots of scrapbook stickers/jewels. I brought my paint and glue. Then we decorated the frames. 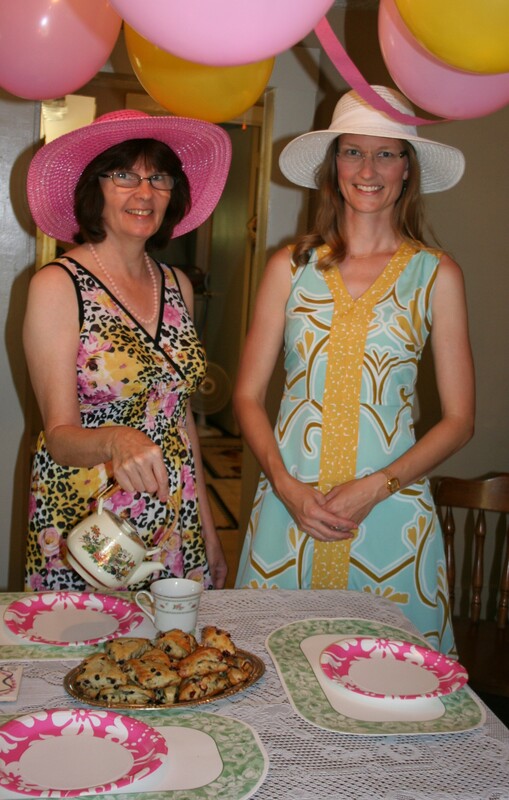 Later, we plan on putting tea party pictures in them. 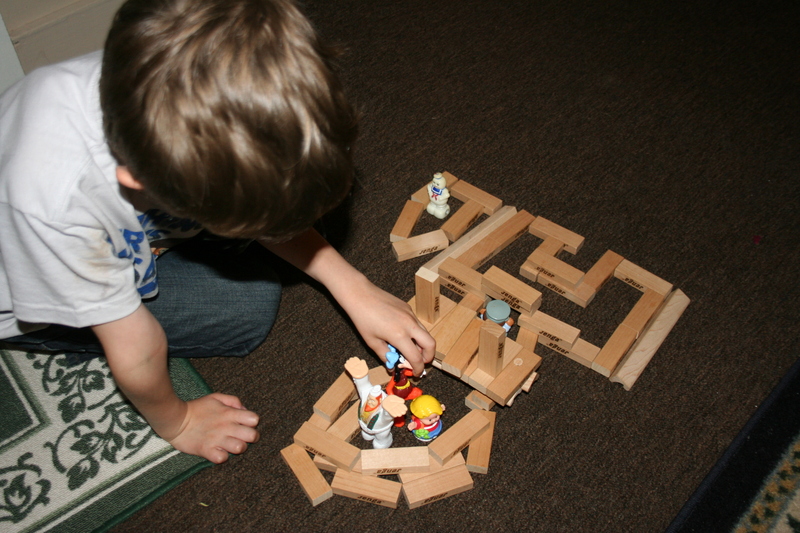 Michael colored his pirate frame and then built the Enterprise out of Jenga blocks. 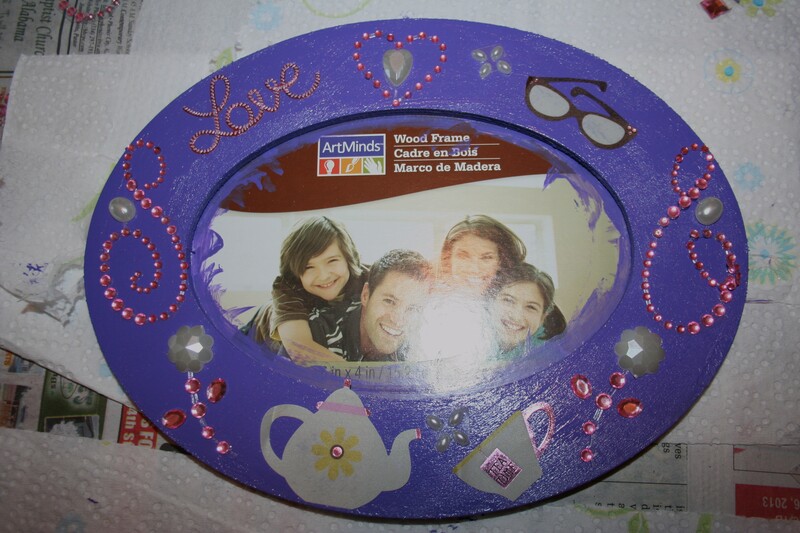 Mom’s frame~ painted purple with jewel and tea pot stickers on it. 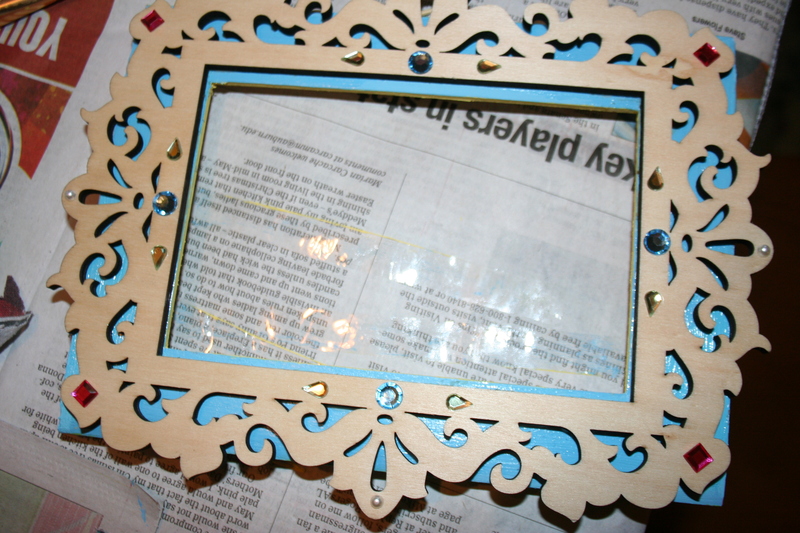 Jennifer’s frame~ Painted light blue then another frame glued on top and jewel stickers on the plain frame. My Frames~ I wanted to do two. 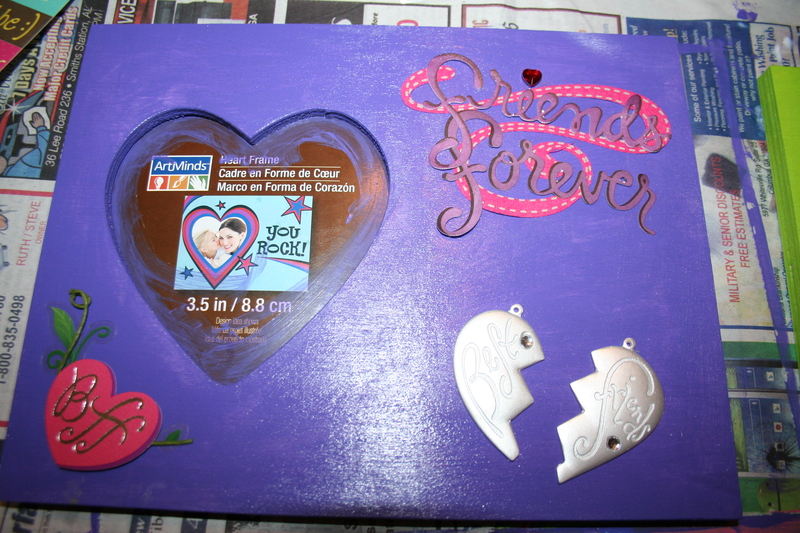 This first one is a Best friends frame; painted purple with BFF stickers on it. 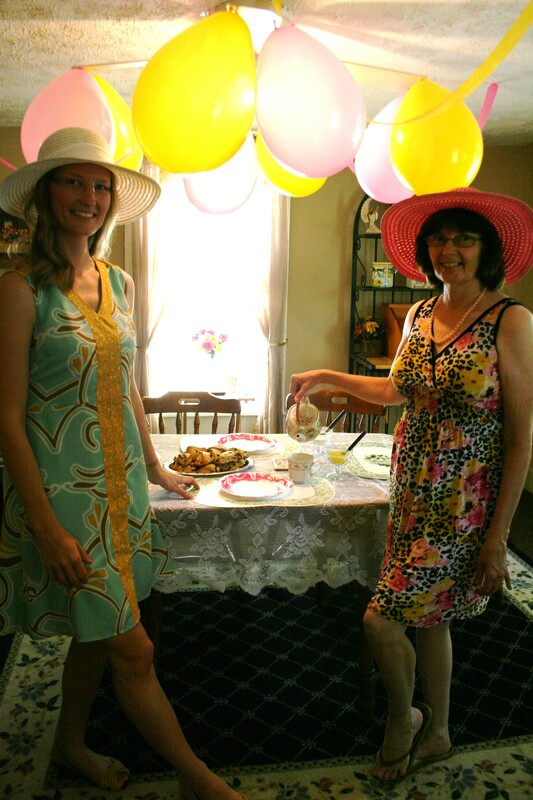 Here is my frame for Tea Party pictures. The left side is light green and the right has pink and blue stripes. 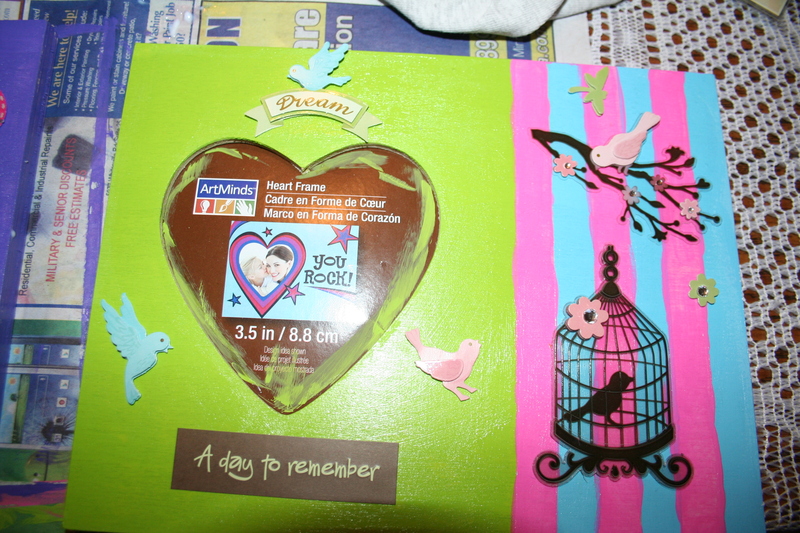 I used these bird stickers and the “A Day to remember” sticker. 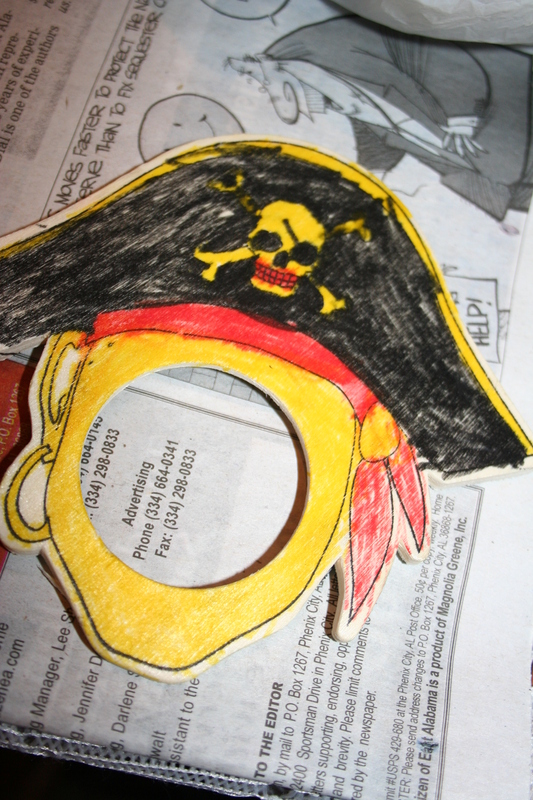 Michael’s Pirate Frame. This one will hold a picture of his Aunt Jenn making the scariest pirate face ever ;p.
Ladies, I hope we do this again because it was a lot of fun! * Thank you to Michael, our part time photographer :). 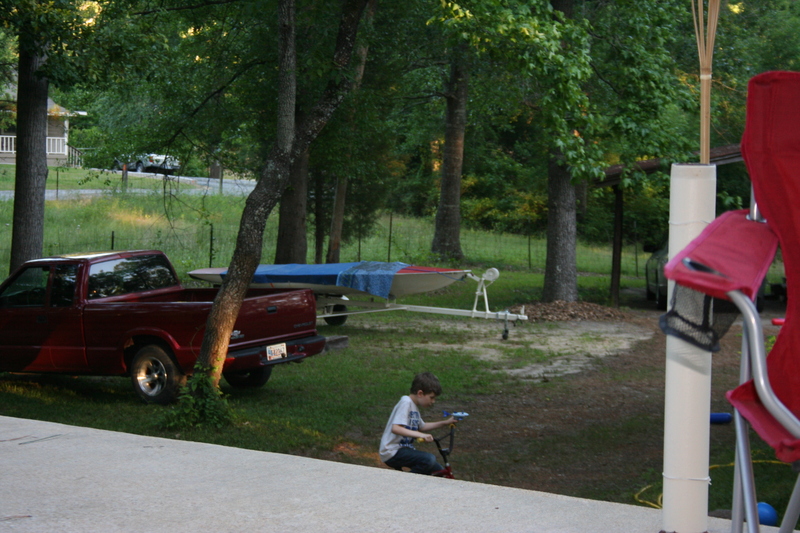 The guys came home from work and we had our Memorial Day weekend celebrations with a cook out. 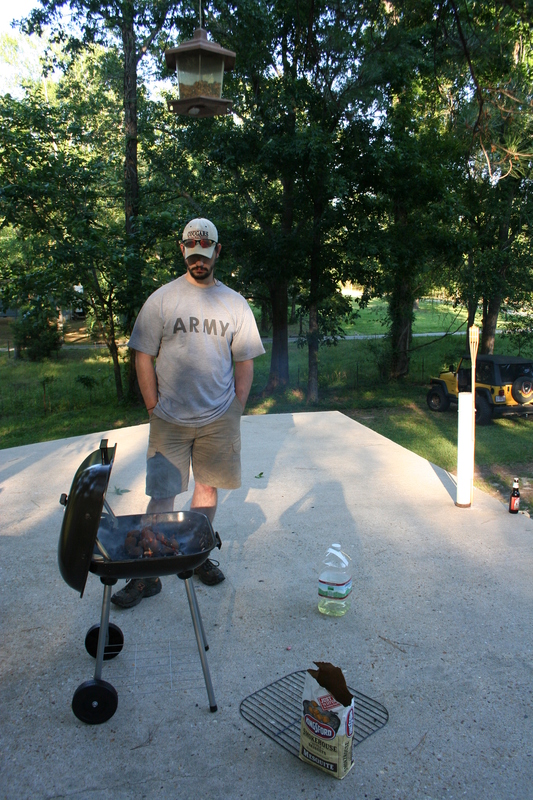 My Step Dad Kim bought a grill which my husband faithfully watched over. 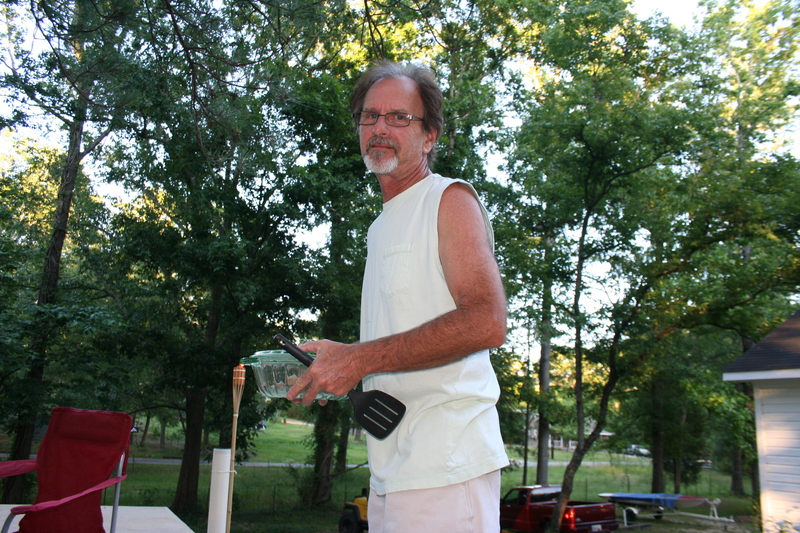 Chris prefers using his hands over a spatula…that’s his inner redneck (or caveman as he sometimes puts it). Ya know I love him. 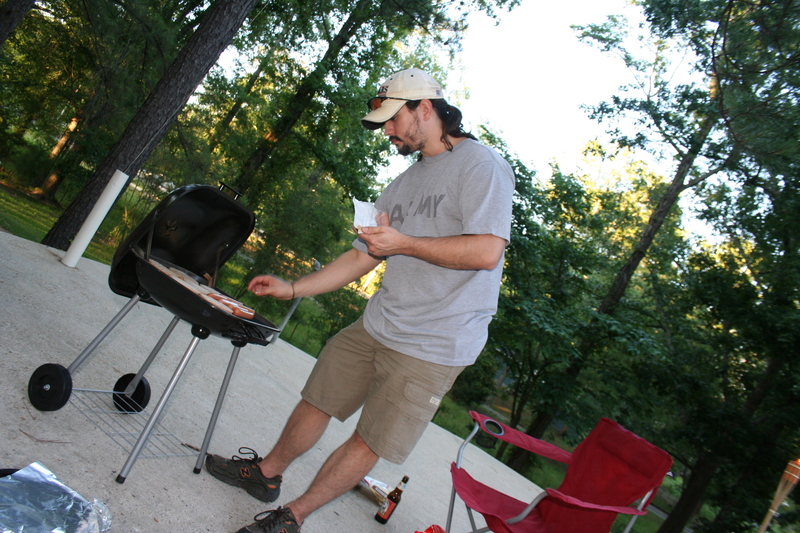 I wasn’t born with the grilling skills that he was :). 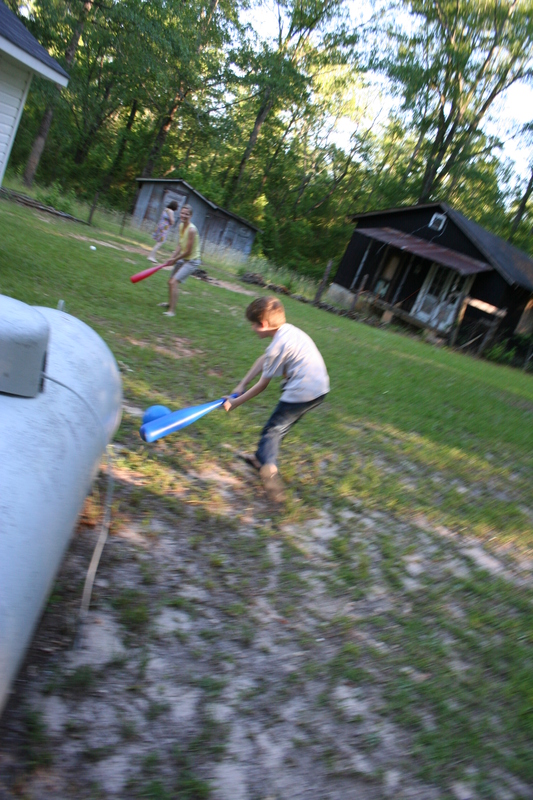 Michael had a blast having Aunt Jenn to himself while they played ball. 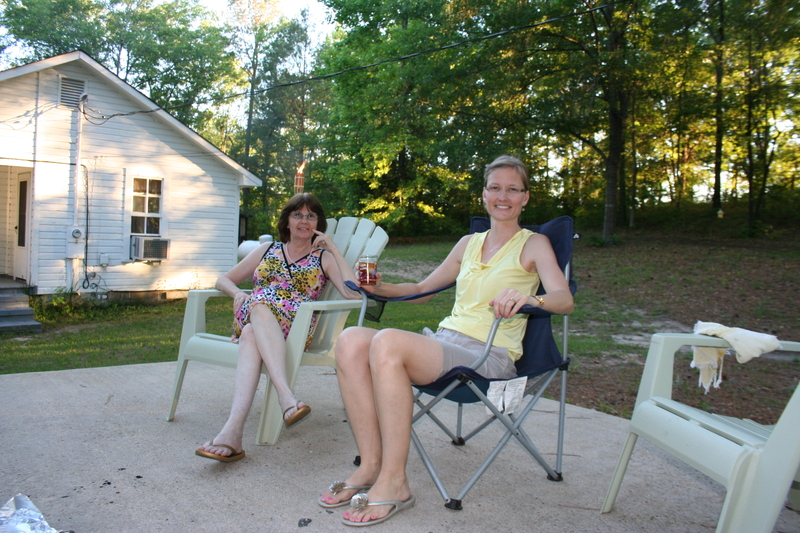 We all rested on the patio while the guys prepared supper (woot!). Michael got some bike riding in. There’s much more room in Nana’s yard so we leave his bike there. Our last day with Jenn before she flew home was on Sunday. 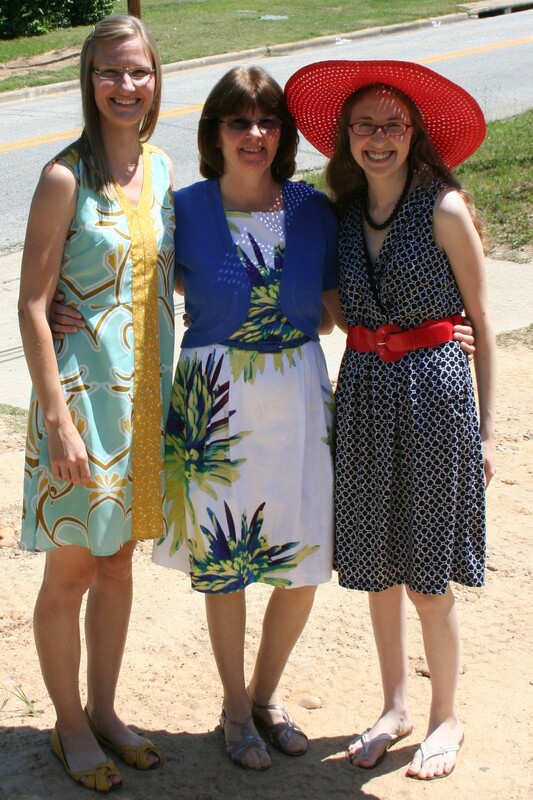 We dressed up for church. 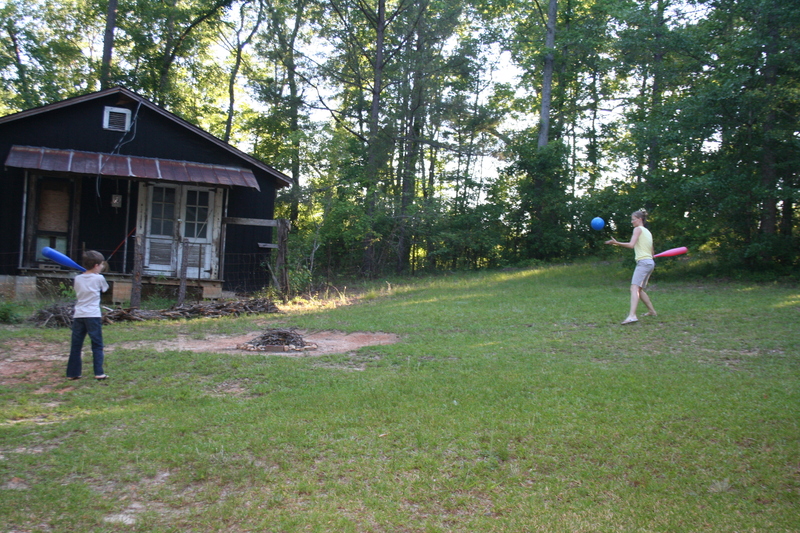 There was a picnic that evening. 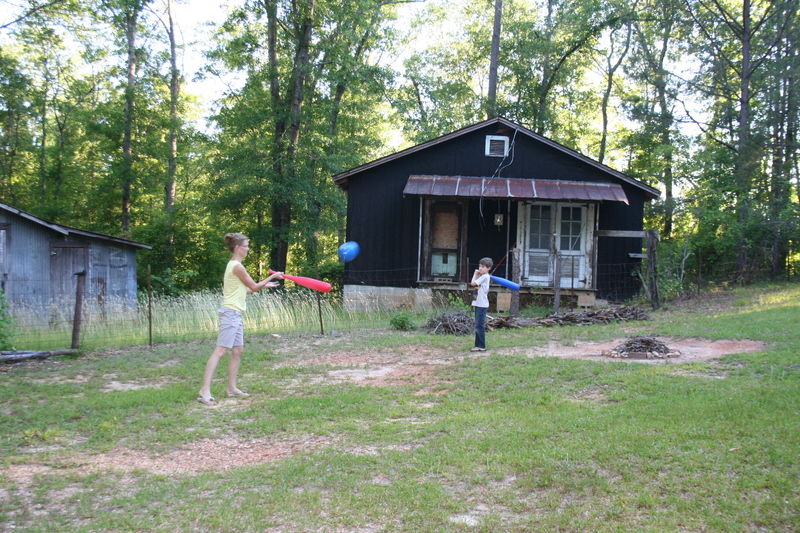 I felt bad so I didn’t get pictures of the family enjoying it. Note to self: too much cheese whiz is a bad thing.